Arguably hottest trend in the local craft beer scene is the growler and a change in the way the BC Liquor Distribution Board classifies them may soon mean the consumer pays more at the cash register to take home their favourite, draught brews. The way the LDB marks up the cost of beer is complicated to say the least. Currently, breweries pay the LDB a per-litre mark-up which is added onto what the brewery is charging for their beer and passed on to the consumer, and the price mark-up changes depending on the level of production of the brewery and whether the beer is sold as "draught", meaning on tap, or "packaged", usually meaning bottled or in cans. For those who don't know, growlers are refillable jugs which hold 1.8 litres, 64oz in old money, of liquid and are used by breweries and brewpubs to sell draught beer directly to consumers to take home. Currently, according to the LDB, when you make your first growler purchase, the brewery pays the LDB the packaged cost per-litre markup. Every fill thereafter is considered as draught and the brewery pays the LDB the lower draught rate. Remember that on the original fill, you also buy the actual growler as well, usually $4-$5, which you then own. For most craft breweries in BC, who fall in the 15,000HL and less category, the first growler fill, is currently marked up $1.04/L (packaged), which totals $1.87 per growler ($1.04/L x 1.8). Subsequent fills, are then marked up at $.72/L (draught) totaling $1.30 ($0.72/L x 1.8), $0.57 less than the original purchase. You can figure out the differences for the larger production category by looking at the difference between the packaged and draught rates. There is also a $.20 deposit thrown in there on the first purchase which makes no sense because who is going to return a decorated glass bottle they just purchased for $4-5 to get a $.20 deposit? Under the new rules, which come into effect April/13, all growler sales will be marked up at the higher, packaged price, no matter if it is the first sale or the 100th refill. That means smaller breweries, under 15,000HL, will be charged the extra $0.57 on refills, a 30% markup increase, and a cost that will most certainly be passed on to consumers, especially by the smaller production capacity breweries who operate on a tight budget and constantly walk the razor's edge of pricing their beer low enough to be competitive in the marketplace but high enough to make a reasonable profit. With some breweries averaging close to 1,000 growler sales some months, this increase quickly begins to add up to big dollar amounts. For example, on a growler that is $10.00 per refill, before tax, the actual increase of the markup on the total cost is 5.7%. That $10.00 growler now costs the consumer $11.20 after the dreaded tax man takes his pound of flesh under the current HST tax system. If breweries raise their retail price to compensate for this increased cost, the final consumer tally would be $10.57 + HST equaling $11.84, a $0.64 increase per refill. Not much in the grand scheme of things, but considering we already pay way too much for craft beer in this province, any consumer increase is too much in my opinion, especially when that increased cost is going straight into the government's coffers and not to the brewery. And just for the record, the ridiculous $.20 deposit fee will no longer be charged at any time. The LDB's explanation to VEBB, in an email, as to why the mark-up change is happening is that, "it was determined that Growlers, both the first fill and all refills, should be subject to the packaged beer mark-up rate because they are packaged for customer consumption off-site." It took me over two weeks and close to 10 emails, to get this information. No one at the LDB seemed willing to "sign off" on a simple request to get clarified how growlers are currently supposed to be marked-up and if it was true the changes were happening. Only when I emailed the LDB Beer Portfolio Manager, Kim Giesbrecht directly did I get a response from the Communications Department less than 24 hours later. I have spoken to a few representatives from breweries that do growler sales and some did not know for certain if they would increase their growler price or absorb the financial hit in order to not alienate their customers while others immediately stated the cost would have to be passed on to the paying customer. Many had not even heard about this change in the way growlers were being marked up and were surprised by the information. I cannot see how some of the nano-breweries, who rely on growler sales as part of their business plan, would have any choice but to raise their retail prices eventually. This increased markup, which really only impacts craft breweries (how many growlers of Molson Canadian do you see out there), shows once again that the government is not being very supportive of the craft beer industry as they continue to make it difficult for these smaller breweries to operate, be profitable and grow. There is also a lot of confusion about this increase and how growlers are supposed to be marked up at present. While trying to research this post, I spoke to several breweries and there were many different ways they were currently being marked up from being marked up the higher packaged rate on all fills and refills, to being marked up at the lower draught rate on all fills and refills to the system I described at the top of this blog. It is my suspicion that the LDB really had no handle on what growlers really were and how they should be marked up, so it slipped under the radar until recently when growler sales spiked significantly. The only thing that is clear is that consumers, who already pay through the nose for craft beer in BC, will be paying a little more for their growler fills in the future so that the LDB can add even more onto their 900 million-plus profit margin they now enjoy. I find it convenient that this increase is possibly being implemented just when growler sales are spiking and when the laws have just been changed to allow for more on-site sales and consumption, meaning more small breweries with tasting rooms and the capacity to fill growlers will be opening. Hidden tax grab negatively impacting the craft beer industry and consumer...I don`t think it is hard to figure out. Back in January, while looking ahead at what was in store for local craft beer consumers in 2013, I mentioned that one of the highlights in my books was the fact that Tap & Barrel were opening a new location Downtown, off Jack Poole Square at the Trade and Convention Centre. 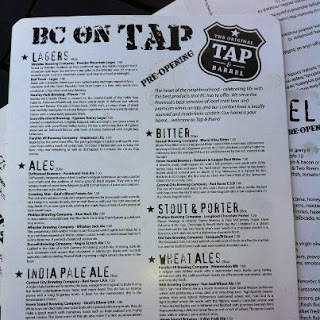 For those not in the know, Tap & Barrel, located at 1 Athlete's Way in the Olympic Village, is yet another venue to enjoy great craft beer in Vancouver, this one with a spectacular view of False Creek, Downtown and the Coast Mountains, and 24 taps of BC craft beer. Yes, that is right, 24 BC taps of craft beer with not an American beer to be seen on the menu, at least with draft beer. I have nothing against the great beers from our American cousins, but I strongly believe that here in BC we have not only caught up to many of the breweries in California, Oregon and Washington States, but surpassed them at their own game, which is pushing the norms and limits of beer styles with creativity and daring. And, in my opinion, not enough credit is given to our local breweries and brewers. Come this summer, Daniel Hospitality Group (DHG) is set to up the ante with the second Tap & Barrel location, located on the west side of the Trade and Convention Centre. Tap & Barrel II promises to be bigger and better and yes, they will be still all BC craft beer on tap, but this time with 32 taps plus two beer engines for casks! Like the original location, they also offer BC wines on tap - 16 at the Olympic Village and 28 at the new location. And the view from the new location should be even more spectacular than the False Creek location, which is hard to beat on a warm summer day. "I have had my heart set in this location since before the Olympics," wrote DGH owner, Daniel Frankel, in an email to VEBB. "I've been negotiating and working on this deal for 3 years now, believe it or not. Good things are worth the wait apparently." Although highlighting BC craft beers is not unusual in Vancouver's craft-beer friendly establishments, being BC only, especially with the number have taps Tap & Barrel has is unprecedented as far as I know. "A very large part of the concept was and is sustainability and being committed to local purveyors/suppliers," wrote Frankel. "I've always felt that local BC products are extraordinary and that we need to support our local economics as well. This is sustainable in more than one way - not only environmentally (reducing the carbon footprint), but also economically sustainable. Also, we've got great craft product right in our own back yards and we're very lucky to have this, so why go elsewhere?" "For years I've gone out and seen import products on tap, and I've always wanted to see a huge array of taps celebrating our own province, committed to our products." Frankel's commitment to local does not stop with his beer and wine as he is staying local with the restaurant's design and decor. "We have been sourcing wonderful unique heritage, local, British Columbia building materials... tin siding from old warehouses, old lights and industrial lamps, reclaimed timber and I beams, gears from mills, old industrial chin, etc... also collecting local BC artwork from Douglas Coupland, to Carla Tak, Pat O'Hare, etc," wrote Frankel. This may seem like a rah, rah, Tap & Barrel post and well, it is. I just happen to be an advocate for locally produced beers and if I have the choice of drinking a BC craft beer over a beer brewed anywhere else, if they are close in quality, I will choose BC 95% of the time. I love the fact that both Tap & Barrel locations are in high-traffic tourist areas, giving exposure for our local beers to out-of-towners,of the non-traditional and traditional craft beer drinkers variety. "They (non-craft beer drinkers) adapt very quickly and that's our objective," wrote Frankel. "We have tons of options, they just happen to be all BC, and they adapt very quickly and non believers learn to love BC on Tap." Which is why I hope others take notice of the BC on Tap and get on board. We have amazing beers here, we should celebrate them. Look for Tap & Barrel II to open some time close to June. I will have located out of town by that point, but you can be sure it'll be on the top of my list of stops when I come back to Vancouver to visit. It appears the City of Vancouver is once again living up to its reputation as being No-Fun City. Despite the Provincial Government's announcement Feb 08 that breweries and distilleries will now be allowed to apply to have on-site lounges, special events areas (SEA), picnic areas and tour areas in BC, it appears Vancouver's restrictive zoning regulations and restrictive liquor laws will make it very difficult for breweries to take advantage of the changes. This change to the law, which the Liquor Control and Licensing Branch (LCLB) states in LCLB Policy Directive No 13-02 is, "designed to support the growing craft brewing and distilling industries by introducing another means for licensees to showcase their products," and allows breweries and distilleries "to apply for endorsement areas at their manufacturing site where patrons may consume liquor manufactured under the licence." Currently, breweries can apply to have tasting rooms where they can either offer the general public free samples and/or sell up to 375ml (12oz) per person, per day to be consumed in the tasting room. The new regulations would allow breweries be able to sell their own beer on-site in amounts more than 375ml per person, per day for on-site consumption. I had this clarified by a LCLB spokesperson who, via email, wrote, "the process for breweries and distilleries to apply for on-site lounges and special event areas will be the same as it is for wineries, in that it will be treated as an endorsement on the manufacturer licence, rather than a separate liquor primary licence." This is the part the City of Vancouver's Liquor License Department (CVLLD) does not seem to understand. According to CVLLD Coordinator, Lucia Cumerlato, breweries would have to apply to have a “neighbourhood public house", which requires a liquor primary license, if they wanted to have an on-site beer lounge. This is in total contradiction to the LCLB's policy directive. Cumerlato did not seem to keen to communicate about the subject of liquor primary licenses and on-site, brewery beer lounges and referred me off to the City's Media Relation's before cutting off email communication when I attempted to get clarification on the licensing issue. The LCLB policy directive goes on to specify the lounges and SEA would allow minors, if accompanied by a parent or guardian, which is definitely not allowed in neighbourhood pubs. It appears Lucia, or City Hall personnel responsible for liquor policy did not read LCLB Policy Directive 13-02. In another written communication from the City of Vancouver, VEBB was informed, "(u)nder City bylaws, the opportunity to take advantage of this new legislation will depend on where the business is located as not all zones allow for Liquor Primary licences." The only zone classification that has the designation as an "outright approval" zone for breweries and distilleries in Vancouver is classified as M-2, which does not allow liquor primary licenses. There are several other zoning classifications that list breweries and distilleries as under the heading of "conditional use" but only one of them, M-1, allows liquor primary licenses. The communication goes on to state that if current breweries are located in zoning that prohibits liquor primary licenses, "a business owner may choose to take advantage of the new legislation by submitting a rezoning application." This rezoning application would be looked at on a case-by-case basis and would involve, "consultation with the community to understand the implications of this new activity on the area." I have not looked into any other municipalities as trying to figure out Vancouver has given me the headache to end all headaches. The current complicated zoning regulations combined with the City's restrictive liquor license policies make it very expensive and difficult to go about getting approval for an on-site beer lounge, not to mention that the process to get a building rezoned, then the liquor primary license application process would mean a long, drawn out time frame that could take years to navigate. The confusing thing is that the tasting rooms are already in place and operating in some breweries. The move simply would allow the breweries to sell their product as opposed to giving it away. Maybe this change in provincial policy was just dropped suddenly in the lap of municipal governments, but the LCLB did say they "consulted" with the Union of BC Municipalities so local governments should have been aware the changes were coming. I get the sense the CVLLD just does not understand what the Liberals were intending and have no idea how to proceed forward, but it shouldn't be hard to figure out as wineries have been doing it for years with great success. If unpreparedness is the case, lets hope the city gets up to speed quickly as any application for lounges and SEA requires "local government /First Nation input as part of the licensing process." At a time when several small breweries are looking to open within Vancouver City limits, the city should be looking at ways to support the vibrant craft beer industry. Breweries employ people directly and create secondary employment. They pay taxes, they buy local products, they create tourism, especially if they would be allowed to have these types of lounges which is why the BC Provincial Government originally gave wineries this ability to promote their own products on-site. Those of us who are advocating actively for changes to the BC liquor laws hammer on the Provincial Government but often it is the local municipal governments who are putting restrictions in place with their zoning regulations and licensing practices. It might be time for advocacy and lobby groups to start targeting City Hall in an effort to make them understand that both the industry and consumers want to see lounges and SEA on-site at breweries. If Vision Vancouver really want to be a visionary government, they should clear up this confusion ASAP. In the written communication from the City, it was stated that, "(t)he City is undertaking a city-wide Liquor Policy review this year, and as part of that work we will study the implications of the new provincial legislation." Let us hope they do because if not, and other municipalities may embrace these changes with open arms and you may see breweries moving out of the city soon to more welcoming and forward-thinking places in the province. When Rich Coleman announced Feb 08 that breweries and distilleries, "can apply to have an on-site consumption area such as a lounge, tasting room or event area," to bring them in line with wineries who have enjoyed this option for years, the change was applauded, but many were cautiously optimistic at best, anticipating that it was not going to be an easy process. The concept, at face value, is a great idea and one that could produce even more growth in the craft beer industry, as having on-site beer lounges, with the ability to sell more than 12 oz of beer per person, per day, for on-site consumption, means that smaller breweries would have yet another revenue stream to help them stay in business. For nano-style breweries, with no business plan to grow significantly via off-site sales, not having to deal with distribution, major packaging or finding retail outlets to sell their brews means less hassle and overhead and an enhanced ability to stay afloat. It could be the change that would allow Vancouver to become a Portland North, with many small breweries within city limits. But, in Vancouver, and most likely many other municipalities, it seems City Hall and the Provincial Government are not on the same page. From what I am understanding, Vancouver's municipal by-laws and zoning regulations, surrounding where breweries can be located and where liquor primary licenses are allowed, do not jive. It appears that breweries may not able to exist in zoning where liquor primary licenses are allowed therefore they cannot get approval from the city for on-site beer lounges which require a liquor primary license. I have tried to make sense of the Vancouver City Zoning Map but on first glance it looks like someone went on a bender of Blue Hawaiian cocktails, beet soup and corn chowder, then threw up on the page. There are so many zoning categories and sub-categories with different allowances and restrictions, I'm going to have to wait until the city gets back to me to confirm just what is allowed and where. As well, the city is very reticent to hand out new liquor primary licenses, so unless they change their attitude and look at the big picture in regards to supporting the craft beer industry within city limits, the changes in the law may have been for not, at least here in Vancouver. The process of getting a liquor primary is a long, difficult process in Vancouver and includes neighbourhood consultations, public meetings, telephone surveys in certain cases, council reports....it goes on and on. You can check it out here if you so desire. It is not the first time one level of government has passed a law that conflicts with another level of government's laws or by-laws. Even though federally it was legal to serve a pint (20 oz/568ml), up until 2010 it was illegal in BC because the provincial serving size maximum for beer was 18oz/500ml. Again, when the Feds passed Bill C-311 allowing for the inter-provincial movement of wine, for personal use, many provinces, including BC at the time, did not allow inter-provincial movement of alcohol for personal use. The province has since tweaked their laws to be more in line with the Feds but if they hadn't, it basically would have rendered the Fed's change to the law a moot point. This may be the case with beer lounges at breweries if something cannot be worked out by the city. I am still in the early days of trying to clarify things. I have contacted Vancouver City Hall to try to clarify some things to see where they stand on the idea of beer lounges at breweries within city limits. I am not saying the city is against the idea, as I have no confirmation of that, but I am hearing that there are major road blocks. I just think that at this point the Provincial Government and the Vancouver Municipal Government may not be on the same page. Hopefully, at the local level, adjustments will be made for these types of licenses to be granted now that the way has been cleared by the province. It could be a great boost to the craft beer industry in Vancouver and with several small breweries, many who would benefit greatly from a small on-site beer lounge, in the planning stages or set to open in the city, it might be a great time for them to support this exploding industry. In the meantime, don't expect to be enjoy more than a few taster glasses of beer at your favourite local brewery's tasting room any time soon. It is going to take a while to figure out the logistics of this mess and you can bet it will be controversial with many NIMBY types and neo-prohibitionists against any support for small, local breweries with on-site consumption. I believe to get City Hall to support small breweries with beer lounges, both consumer and industry groups are going to have to lobby and advocate loudly. CAMRA Vancouver, is this your next campaign? Campaign for Culture? It looks like it is time to start focusing locally instead of provincially in regards to advocating for the craft beer consumer. Last Friday, when I read the media release from Rich Coleman's office announcing changes to BC liquor laws, I felt proud to know that CAMRA Vancouver had a hand in bringing those changes about. CAMRA members, you may not realize it, but we, as a consumer advocacy group, did play a role in educating politicians about the issues and did put pressure on the government to make these changes regarding both tied houses and the on-site tasting room-lounge consumption areas. These changes specifically benefit craft beer consumers and they were issues that were particularly targeted by your executive over the past few years. We may not have been the major players that helped prompt these changes, but I, as a past president can tell you we were definitely in the mix. Although every member may not have played a direct role, or even known what was going on with the executive in regards to advocacy, they did play an indirect role in that CAMRA Vancouver was able to state to both government and bureaucratic officials in various communications that we were representing a group of concerned consumers that numbered close to 800 members. As such a large group, and one that continues to grow and expand, those in positions that can make decisions to effect change have to pay more attention. Your support and membership in CAMRA Vancouver gives those advocating on behalf of your consumer rights more strength, legitimacy and power. Our voice in regards to tied houses was heard loud and clear, starting with then President Martin Williams's letter to the Liquor Control and Licensing Branch in Feb/11 voicing CAMRA's concerns about completely deregulating tied house and trade practice laws. Myself and former CAMRA Vancouver VP, Dieter Friesen, took CAMRA's concerns forward again about a year later to then alcohol critic, NDP MLA Shane Simpson. That meeting led to CAMRA Vancouver arranging for Shane to tour three breweries in his riding to meet with brewery representatives and talk about their concerns and what changes would benefit their businesses. One of the topics that was discussed was tied house rules and how having some sort of controlled-limited tied house opportunities for some small breweries would be beneficial for businesses and consumers alike. This original meeting and tour led to Mr Simpson raising the subject of tied house restrictions in the BC Legislature bringing the issue to the attention of Rich Coleman, minister responsible for LCLB/LDB. CAMRA Vancouver then arranged a second meeting with Mr Simpson and players in the local craft beer industry to again discuss pushing for some modifications to the tied house laws. The tasting lounge, on-site consumption issues was also discussed at this meeting. Mr Simpson once again wrote a letter to the LCLB querying as to what was being done in regards to tied houses and pushing for limited allowances for tied houses to exist. CAMRA Vancouver has also been liaising with other advocacy groups such as Modernize Wine and The Campaign for Culture and these meetings were very informative as all three groups were able to share information and coordinate on issues where we have common concerns such as tied house deregulation. We were looking at moving forward together to some degree, but that need, in regards to tied houses was nullified by last Friday's announcement. In regards to the on-site consumption and lounge laws, CAMRA Vancouver did play an active role in contacting many craft breweries to help them coordinate and encourage them to write the LCLB when the call went out for consultation last June. This coordination helped prompt a huge response from the industry which led to the government making the changes to bring breweries and distilleries in line with wineries in regards to on-site consumption opportunities. Pushing to get the craft beer consumer and the craft beer industry the same rights and freedoms that the wine consumer and industry enjoy has been something CAMRA Vancouver has been hammering away at in communications with the LCLB and the Liberal Government. This one change to the law gives me hope that if CAMRA Vancouver, CAMRA BC and the CAMRA membership keep advocating for the same rights, freedoms and privileges that wine consumers enjoy, one day corkage for beer and inter-provincial importation of Canadian craft beer, with no provincial markup on cost, will be allowed as it is for wine consumers. CAMRA BC and CAMRA Vancouver were also among the throngs protesting about the proposed privatization of the LDB warehouses. Letters were sent to many Liberal politicians and to the LCLB voicing our concerns about how the move may negatively impact consumers. I was asked to appear twice on CKNW radio to represent CAMRA and talk about these concerns as well, raising awareness as to how this move may be bad for consumers. As you all know, the government eventually trashed the idea to privatize and backed away. The huge outcry and protest from various groups, including CAMRA, the only group speaking on behalf of the craft beer consumer, played a major role in the privatization idea being abandoned. Be proud CAMRA members, we have accomplished a lot the past few years. I have no illusions that we have been solely responsible for any of these positives changes as there have been many different groups lobbying the government both publicly and behind closed doors, but I do believe 100% our group has contributed to the push towards reforming our outdated liquor laws. Continued CAMRA growth will bolster numbers and provide CAMRA Vancouver and CAMRA BC with more money to educate and advocate and continued-increased support of our executive will help CAMRA Vancouver be more successful in their quest to protect the rights of craft beer consumers. Because at its core, that is what CAMRA is all about: educating about craft beer and advocating on behalf of craft beer consumers. We are more than just a beer drinking club and whether you realize it or not, by supporting CAMRA Vancouver, you are making a difference and are apart of the solution. Just think about what a difference we can make as an organization if we as members all commit to being more engaged, to answering our executives call to support campaigns, participate in social media blitzes and get more involved. It only takes minutes to make your voice heard and the more voices heard by the government, the more they are likely to listen. Today, Rich Coleman, the minister responsible for the province's alcohol portfolio, announced some long anticipated changes to BC liquor laws, many of which have a direct impact on the craft beer industry and craft beer related licensees. "Small- and medium-sized liquor manufacturers" to have "three common ownership and business relationships with licensed establishments located off their manufacturing site." Translation, tied house laws have been relaxed and you will soon be able to enjoy Parallel 49 beers at St Augustine's come March 1/13. ""Brewers and distillers now can apply to have an on-site consumption area such as a lounge, tasting room or event area." Translation, beer lounges at breweries are not far off. "Rules around how liquor manufacturers can promote their products in bars and restaurants have been simplified by removing the requirement for a buy-sell agreement." Translation, breweries can now buy tap and shelf space legally and bars restaurants will be able to demand inducements for the right for a brewery to sell their product via the licensee. These changes are to take effect March 1, 2013. Some of the wording is somewhat vague, for example, what is a small-and-medium sized liquor manufacturer in regards to a brewery? My assumption is that they mean breweries who produce less than 160,000 Hectolitres per year, which means the big boys like Molson and Labatt cannot have tied houses. What is yet to be seen is whether Granville Island, owned by Molson, will be able to have three tied house arrangements, thereby giving Molson a way through the door. But even if this is the case, the press release goes on to explain that tied houses must also "carry a variety of products from different suppliers to avoid particular products being favoured," meaning they cannot shut out the competition in these licensed establishments. Another question I have is how is how difficult are the government going to make it for breweries to have on-site beer lounges, which are essentially liquor primary licenses. Does that mean over-19 years old allowed only? What hoops will the brewery have to jump to get these licenses? This is the most significant of all the changes for craft breweries, in my opinion as now small nano-style breweries can operate and exist without ever having to distribute their beer. Growler fills and bottle sales from the tasting room-lounge combined with lounge revenue could be enough for these smaller breweries, with no plan to expand, to exist. This is, as far as I understand, the business model for Brassneck Brewery, who, under the new laws, could also offer their products at the Alibi Room due to the tied house law changes (Brassneck and the Alibi both have Nigel Springthorpe involved in ownership). I am going to dig more and talk a bit more about how these changes could impact the craft beer scene come March 1, 2013 after I do some digging and reflecting on the announcement. As with everything announced by this government, I will wait until the fine print is produced to see just exactly these changes mean. The BC Liberals have a habit of making announcements that look to be making big changes to liquor laws when in fact, they are little more than tweaks and minor adjustments when the full extent of the changes are understood. 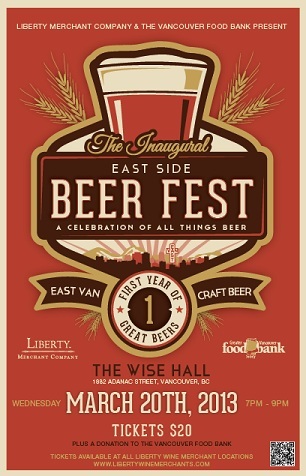 Help Feed Vancouver's Hungry by Drinking Craft Beer!! How do you feel about combining the activity of drinking world-class craft beer and helping feed Vancouver's hungry and less fortunate citizens? 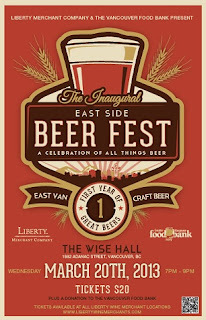 In support of the Vancouver Food Bank, and as a thank-you for the support of local craft beer consumers, Liberty Wine Merchants of Commercial Drive is organizing the "Inaugural East Side Beer Fest", March 20th, 7pm to -9pm, at East Vancouver's WISE Hall, located at the corner of Victoria Drive and Adanac Street. Admission is $20, with tickets currently available at all Liberty Wine Merchant locations, and a non-perishable food item for the Food bank, to be dropped off at the event. The event is described as "self-guided" and the tasting is included in the entry price meaning no tickets or tokens need to be purchased inside the event! "This is our way of giving back to the community that has supported us through our first year on Commercial Drive," wrote Liberty Commercial Drive Manager, William Ford in an email to VEBB. "We have been very fortunate to be embraced as part of the community and this event is our way of showing our gratitude to our patrons and neighbours." Driftwood, Parallel 49, Howe Sound, Lighthouse, Mill St., Propeller, Beerthirst, Copper & Theory, Beverage Concepts and BrewDog have been confirmed with more participants to be announced. There will be a few local, artisan food booths in attendance and hopefully, if things go to plan, one whiskey booth, although nothing has yet been confirmed as to who the whiskey vendor will be. You may be wondering why a store known for selling wine is organizing a beer festival. If you have not been into the Commercial Drive location, and you love craft beer, you should pop your head in the door. "Beer has been chosen because we have noticed that east side residents are passionate about beer and, more specifically, passionate about craft, artisanal ales," stated Ford. "We listen to our patrons and try to work together with them to offer the best service and selection we can." It is my local bottle shop and I am never disappointed with the great beer selection when I go in. Within weeks of opening, this Liberty location had already put together a great inventory of craft beers, with a particular focus on Belgian beers. Ford, like all Liberty managers, has been given the leeway to tailor his stock to local tastes. I actually selfishly hesitated about writing this post as I would love to keep Liberty the hidden secret that it is where I can often find the limited releases, for decent prices, that local beer nuts scour the city in search of, after they have disappeared from the shelves of other stores. "What's unique about Liberty Wine Merchants is that each store has it's own personality that is shaped by the demands of their demographic as well as the workers in that store," says Ford. "Commercial Drive has noticed our craft beer selection has been a hit over the past year so we decided to host a charitable tasting event with that focus." Prices are also very reasonable at Liberty compared to some other liquor retail outlets. Because they are located just a block or so from the government liquor store, Liberty has to be competitive. "We want people to know that we work tirelessly to hunt down the best values in the market and I think our prices reflect that," reports Ford. "A testament to that would be that all of the government-store listed items will be on our shelves for less than a loonie more. This is a good reason why we are the #1 LRS for the Central City Red Racer IPA." Hopes are that this festival will be a success and turn into an annual event which will allow Liberty thank their supporters while giving back to those in need in the community. At $20 plus a non-perishable food item as the admission cost, it is a great deal and helps support those less fortunate in our community by helping them put food on their table.